PERRIN High-Flow Fuel Rails incorporate large inside diameter channels for maximum fuel flow. This allows for cars to run 800 WHP without inconsistent fuel flow to each cylinder. We include custom made -6 barbed fittings with O-rings to ensure a proper connection to the hose. These fittings are removable allowing for easy customization of aftermarket fuel lines. The equal flowing nature of PERRIN fuel rails allow your high powered Subaru to make more power, safer. A must have for any car looking to exceed 400 horsepower. PERRIN High-Flow Fuel Rails split incoming fuel for equal fuel distribution, pressure, and more consistent air fuel ratio between all cylinders. The stock fuel rails route the fuel through the engine bay sequentially providing each injector with fuel. In modified Subarus, this drastically reduces fuel delivery to the last injector in line. 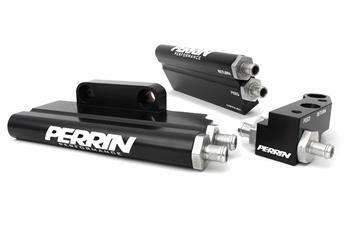 The PERRIN fuel rails and distribution block are precision CNC machined from 6061 billet aluminum. Each -6 Barbed Fitting is removable from the rails and distribution block allowing for easy customization of aftermarket fuel lines. All PERRIN High-Flow Fuel Rails come with built-in phenolic spacers. The spacers fitted to fuel rails and junction blocks sit between these and the engine, insulating it from heat. This keeps fuel closer to its normal ambient temperature. In contrast, without these spacers, you can see fuel temperatures rise far more than 30 degrees above ambient. PERRIN fuel rails feature large 3/8” inside diameter fuel injection hose which provides higher flow rate than competitive systems. This hose is large enough to support 800+ WHP. Included hose is a DOT approved, rubber fuel injection hose with proper liners for zero emissions. A byproduct of the hose being constructed of rubber is that it helps dampen the fuel against pressure waves and, in turn, creates a smoother and more constant fuel pressure. PERRIN flexguard is a high abrasion strength and heat resistant woven ballistic nylon that helps protects your hose from wearing during vehicle operation. Designed for use in applications up to 260 degrees F continuous and treated with heat and flame resistant coating. This is a style of hose cover that is used on race cars around the world. PERRIN High-Flow Fuel Rails include stainless steel lined Oetiker clamps. Oetiker clamps have a secure fit since there are no gaps in the band which creates a better seal; their clamping mechanism will not loosen over time like traditional worm drive clamps. They are also much easier to install with one squeeze of the Oetiker crimping tool.